So after all the E3 craziness of last week, there was (obviously) a ton of media coverage on all the new motion control, older rehashed games, and interactive tigers. A few of my friends run a very entertaining podcast/blog called Jump Kick Punch! and they asked me to do a little guest-spot with them in their E3 review and re-cap. Head on over there if you've got some serious time to kill and would be entertained by four mid-20's guys yammering on about the current world of videogames in a beer-fueled frenzy of swearing and belching. If the previous sentence didn't illustrate this fully, the language is a bit PG13 (okay, R) so don't go blasting it at the nursery where you work or anything. Fun fact for people that don't know me personally: I apparently swear a LOT. I wasn't aware of this until I listened to a recording of myself. The project that soldiers on. 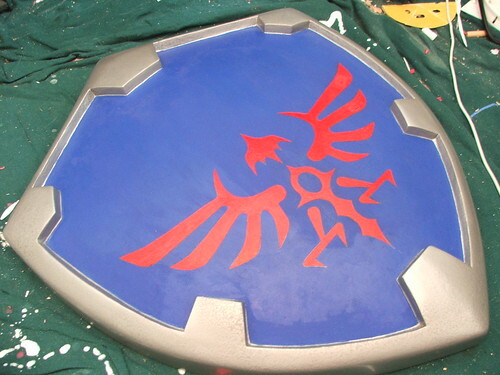 I've only been working on this between other builds, so its been slow going, but the base paint work is done and now I can start mounting the filigree pieces on permanently. The full set! 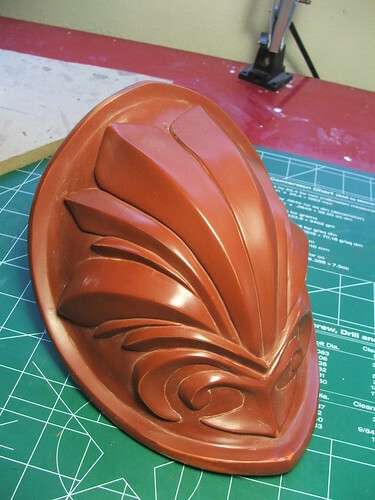 So far most of the progress has been on her pauldron shoulder armor - a clay sculpt which will be cold cast in resin to make 2 duplicates. 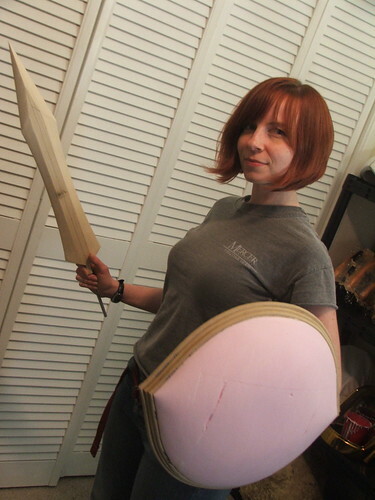 Recently I've started on the shield and sword as well. While they're only just blocked shapes so far, they're coming along nicely. 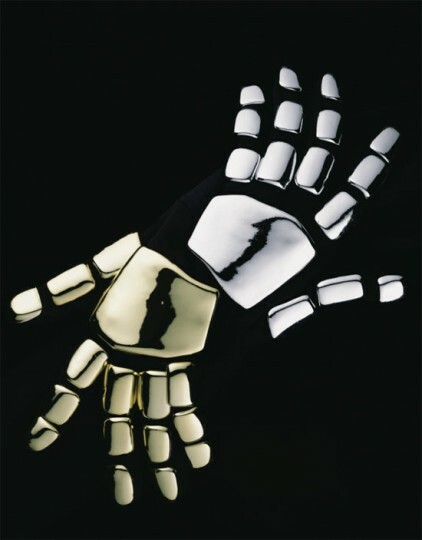 To complete the Daft Punk look, I'm making their hand plates as well as the helmet. 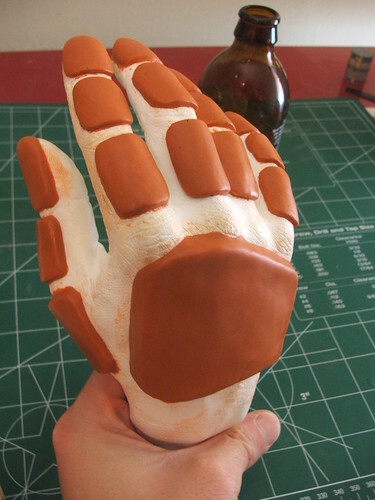 The initial pieces are clay sculpted over castings of my hands. 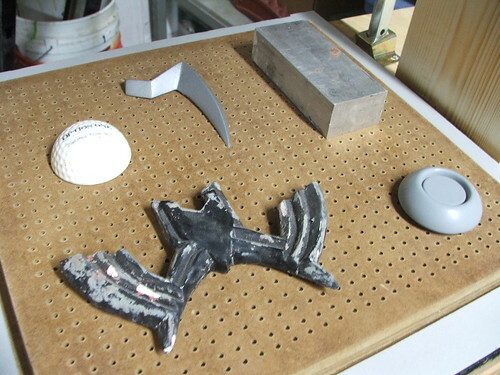 These will be sanded to a smoother finish then vacuumformed in styrene plastic and sent out for plating. And, finally, everyone's favorite. Another video of the Daft Punk Helmet, with lights and tinted visor! Just need the interior padding and we're ready for the final photoshoot and write-up. Thanks for reading, and if you choose to visit my friends at Jump Kick Punch! then thanks for listening! 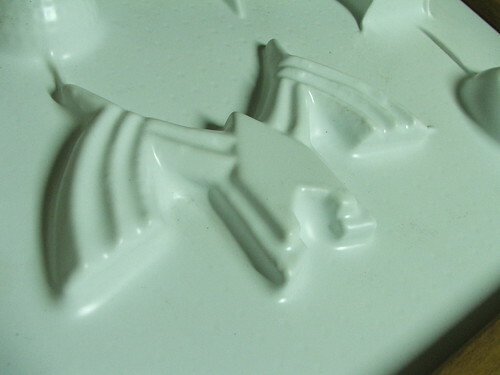 I have long wanted a vacuum-forming machine of my own, and after scouring tons of resources online, I finally decided to try my hand at it. My former is a little bit different from others I've run across. My wife and I recently received a new toaster oven for our wedding (Thanks Cindy, Susan and Terri!) so the old one that followed my wife through college was now up for harvesting. 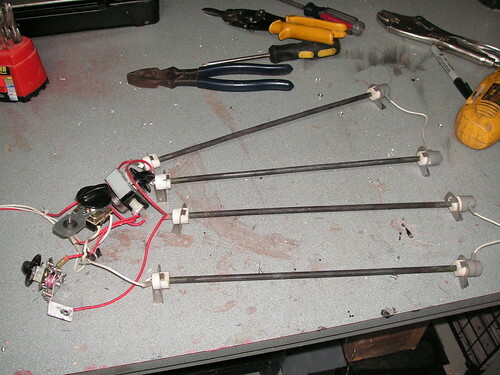 I decided to take out the heating elements - these being often the trickiest part of most people's vac-former builds - and make myself a vacuum-former around them. 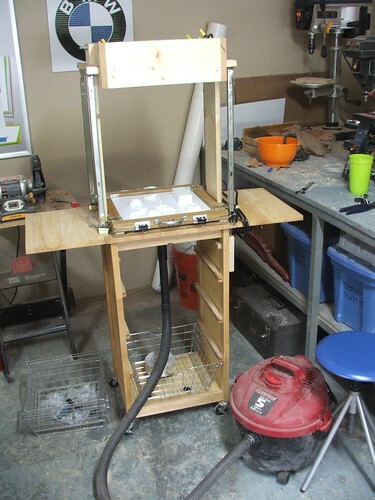 This limited me to the size of the heating elements, but since this is my first ever attempted vac machine, I figured it couldn't hurt to start small. First thing was first: I had to dig the coils out of the old machine. The flash in the picture makes it look worse than it was, but we're talking about 5 years worth of corn dogs and mini pizzas here. This thing was nasty. And the guts I excavated. In the end, I didn't end up using the temperature control switch or the timer. The "bake, broil, toast" is only a rotary switch that turns individual heating elements on and off, so that was scrapped as well. The wires had a nice heat resistant shielding on them, so I re-purposed those later. They even had their very own fancy ceramic posts! 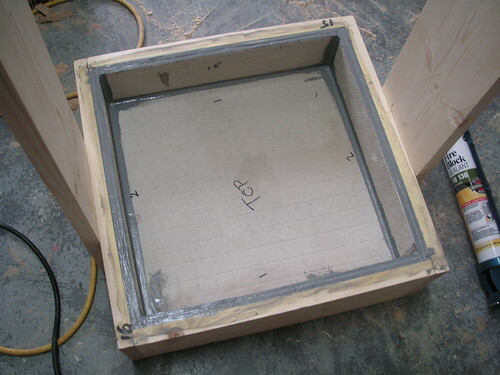 The heating elements dictated the size of the oven box, which itself dictated the size of the frame and platen. 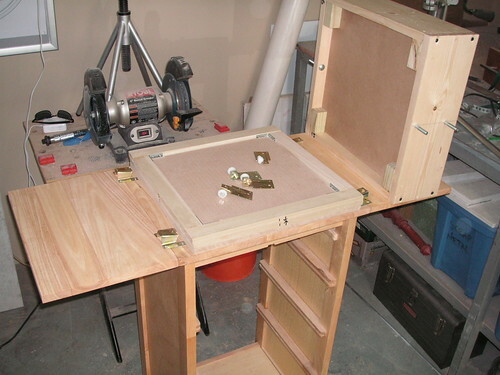 In the end I would up with a 14" x 14" work area. 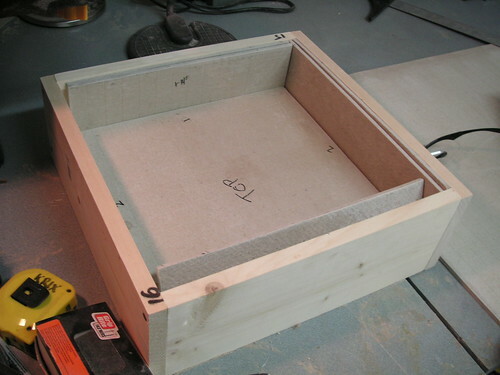 This is the oven box going together - its a maple box lined with 2 sheets of 1/4" hardibacker concrete board. 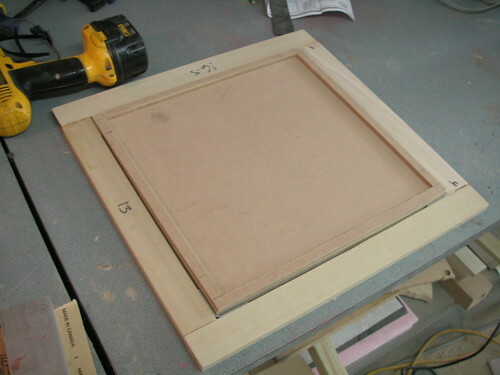 From the dimensions of the oven, I worked backwards to figure out the size of the platen and frames. 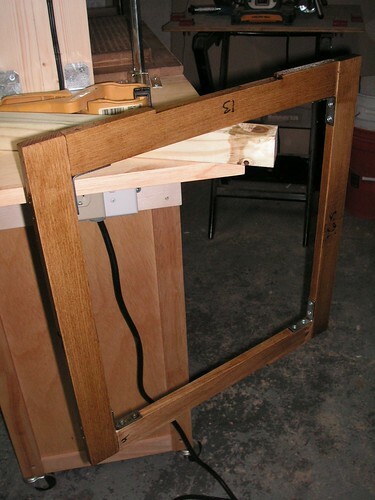 Frames are also maple, held together with L-brackets and wood glue. 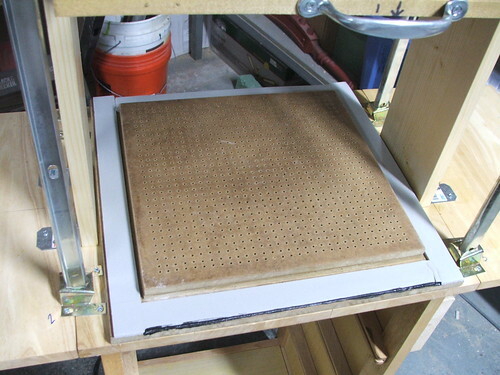 For the platen, I took two sheets of 1/2" MDF and sandwiched them around a sheet of 1/4" MDF. 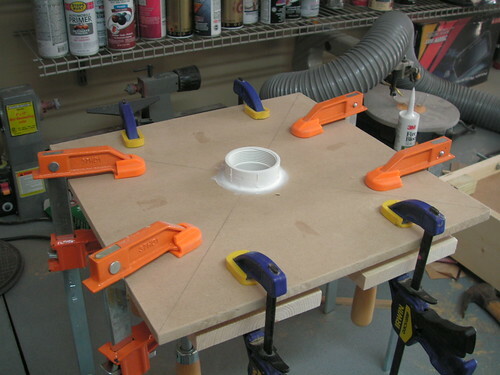 The 1/4 was trimmed to about 3/8" wide to form the inner hollow area. 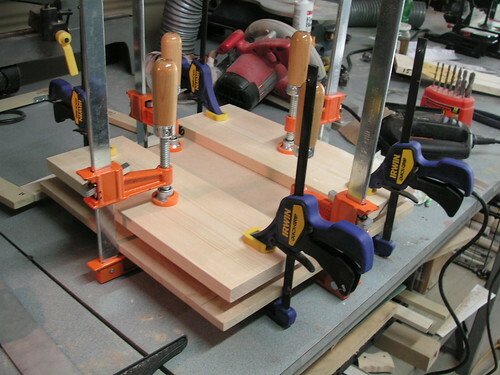 These were clamped and set to dry overnight. 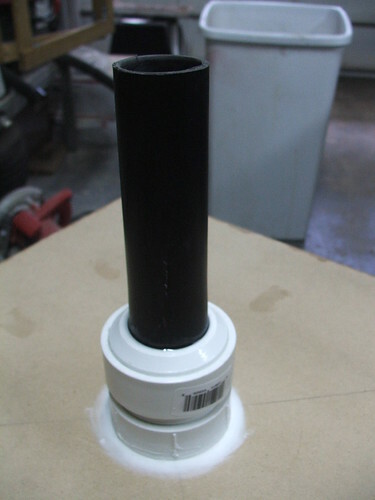 On the underside, I glued in a threaded piece of PVC and sealed the seam with caulk. The threads allow me to use a different adapter if I ever step up to a larger vacuum pump in the future. This is the cobbled-together adapter I'm using for now. All sealed with caulk as well, it pressure fits onto my shop vac hose. After this came the drilling. And then more drilling. And some drilling after that. 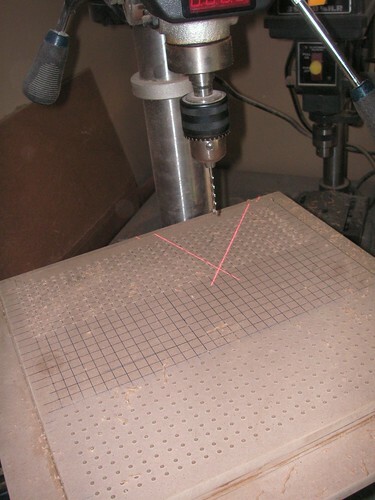 I don't know what I would have done without the laser guides on my drill press. The holes are 1/8" and spaced every 1cm. This was based on my "well, that seems like a good idea" research, and some hinted-at suggestions online that smaller holes over a larger area work better. I got the rolling table when stopping by my parent's house to pick up some of their old furniture. This used to be their kitchen telephone table. Initially, I had planned to remove the leaves, but had to include them in the end because the table top was about 4" too narrow. 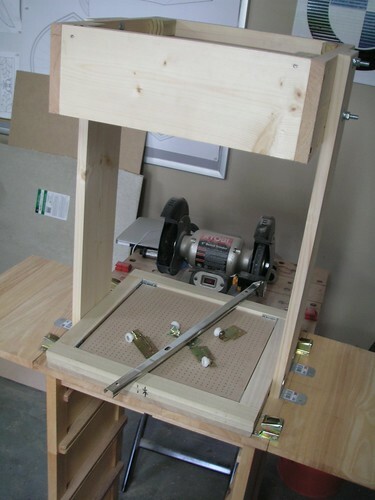 Here's the freshly drilled platen and the oven box ready for mounting. 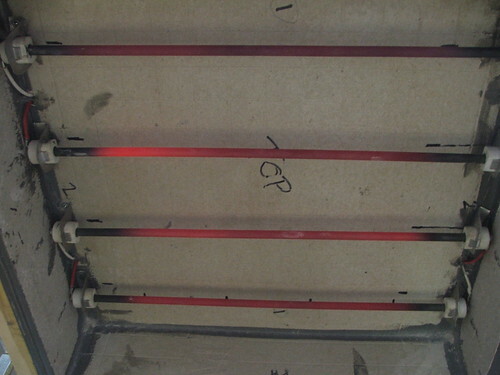 The inside of the oven before mounting the coils. I used fireplace caulk to seal the edges and seams of the hardibacker board. I also used this later to seal the wiring going into the oven. To articulate the plastic frame and move it from the oven to the platen, I tried something I've not seen used before: drawer rails. Similar to the idea of using toaster oven heating elements, this was something that seemed to make sense in my mind, despite never having seen it employed before on anyone else's build. 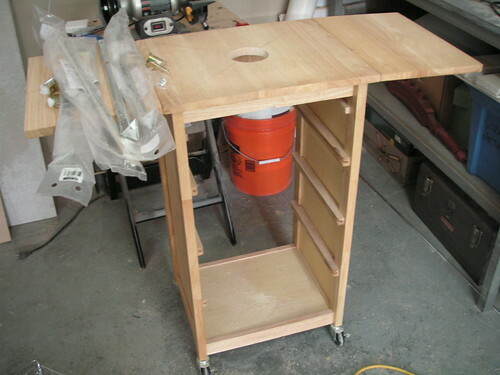 I bought 4 of these at home depot - 24" long - and mounted them to the table and frames. They took some adjustment, but overall the result is great. Smooth action and dirt cheap! 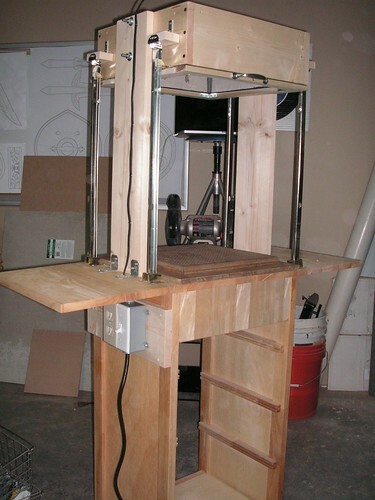 I also stained and sealed certain pieces of the machine to protect them from wear and tear. 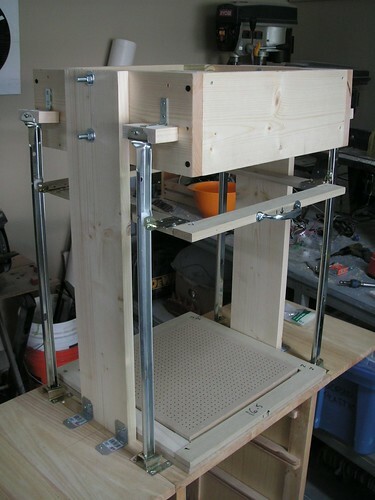 The platen and frames were stained and sealed, while the oven and support arms got a coat of wood hardener. 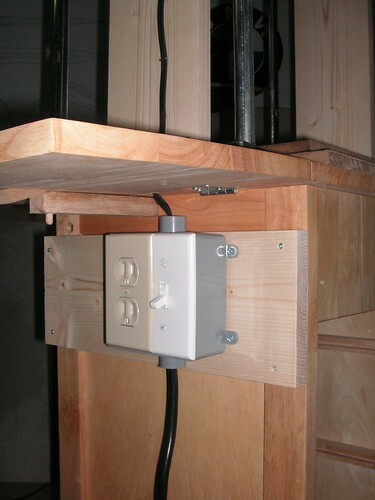 For power, I ran a grounded line to a distribution box with its own outlet. The switch here controls the oven, and the outlet is used for the vacuum and heat gun. Don't laugh at my rigged-up switch plate - I had a few of these laying around and I was trying to get this thing together as cheaply as possible! The oven wiring took a little trial and error to get right. Initially I had the entire thing running in parallel, but this tripped the breaker in my garage a few times, so I had to change the wiring configuration. I decided to do 2 coils paired in parallel, and then wire these two "banks" together in series. That worked out well, heating the elements nicely but not popping my breaker. I had a few more things to do before firing it up. 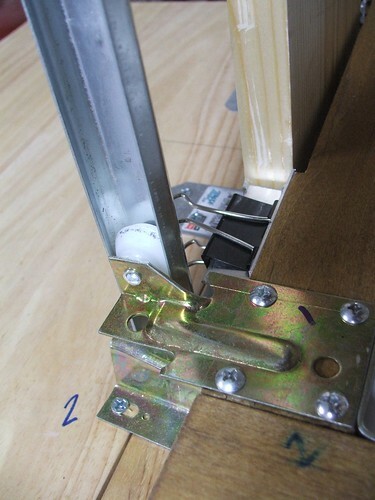 The frames needed a way to clamp to one another to hold the plastic in. I used some aluminum L-channel stock and cut 2" sections from it. 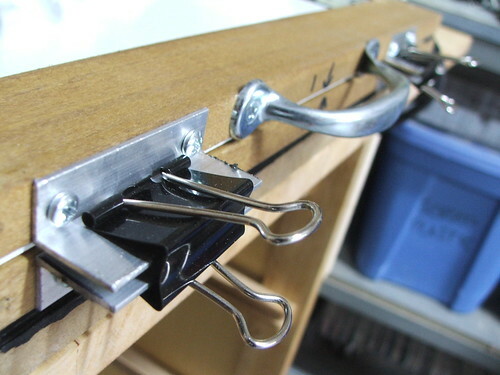 These were screwed to the frames and secured around the plastic with binder clips. I have somewhere around 600 of these things in my house from a previous project, so I'm always trying to find new ways to use them. 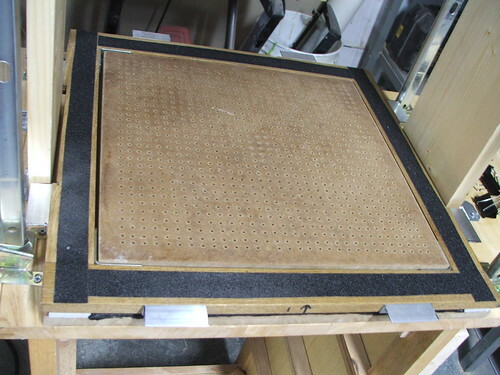 I also added a strip of closed-cell foam around the platen to help seal the vacuum when I lowered the frames down. Additionally, I added non-skid tape to the insides of the frames to better hold the plastic in place. And the first pull! 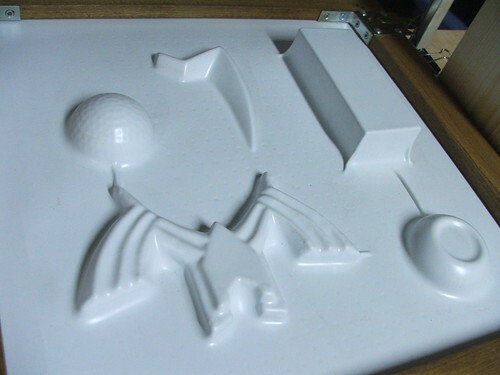 This was with .060" styrene - I'm betting I can get really good definition with some thinner stock, but its what I had available. A close-up of one area. Not bad for a first pull! The finished beast, complete with battered shop-vac. All told, this project cost me around $100. Most of the components I already had laying around from other builds, so I guess if you had to go from scratch, it might end up running $150-$175 or so. 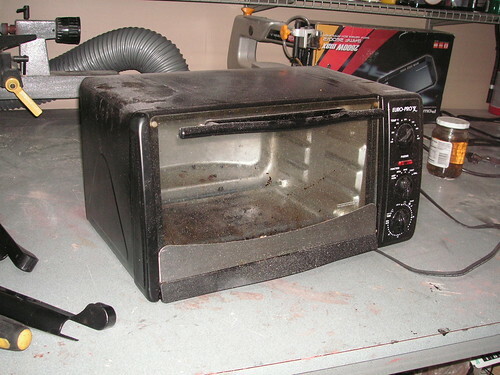 Best of luck fellow DIY-ers, hopefully we'll start to see some more toaster-oven formers popping up in the future. As always, thanks for reading!